We are not Jewish, but many people in our area of Maryland are, and as such, today is a holiday and neither of us had to work. Hooray! So to thank the Jewish people for celebrating their New Year today and allowing us a glorious and much-needed day off to relax and go to the movies, I decided to honor them by trying this recipe for Phyllo Knishes. "What is a knish?" my Gentile friends are sure to ask. Well, from what I understand - having just eaten them - it is a pastry stuffed with potatoes, or sometimes with kasha. What more must be said? The first time I ever had one was when I lived in Boston. My friend Sarah got me one from a Jewish deli in Brookline, Mass. and it was very, very tasty. Tonight was the first time I tried to make them though. Our recipe was just OK. It was a little bit bland. We put sour cream on them on recommendation from my coworker. This is not a make-again recipe, but it isn't bad. I managed to cut myself with a bread knife. The bandaging makes it to hard to type, so bear with me. On to the food.... Sometimes when I am folding laundry in the bedroom I watch crappy shows on the Food Network, like Cooking For Real. Sometimes the people actually make stuff that looks good. I saw Sunny Anderson make these pizzas the other day so I decided we should have them too. I made a lot of changes. We used a nice Asiago foccaccia from Panera. I skipped the porcinis and just used canned mushrooms on mine because neither of us wanted porcinis. On my pizza half, I put cheese (fresh mozzarella, shredded mozzarella, and Parmesan), sliced tomatoes (not canned), and the mushrooms. The other had the cheese and some pepperoni. On both, I put garlic, salt, pepper, and Penzeys Pizza Seasoning. We skipped the fresh basil. It only took about 12 minutes to cook, and it was cooked beautifully!!! Delicious and tasty. We really liked our variation of this pizza recipe and would make it again as long as we can continue to get foccaccia from Panera!! There are only two things I have to say about this. 1) I buy Girl Scout cookies in bulk when they are selling them, and then I hoard them in the freezer so I can enjoy them year-round. Even now, I still have more Thin Mints in the freezer. 2) These are the best muffins ever created of all time and you MUST make them RIGHT NOW. If you cannot find Thin Mints, you could use Keebler Grasshopper cookies, or you could even just use Oreos. Or wait til the Scouts come out and make them with real Thin Mints. But you MUST eat these muffins. In a medium bowl, whisk together flour, sugar, baking powder and salt. Cut in cubes of butter with a pastry blender or two knives until mixture resembles coarse crumbs. In a small bowl, whisk together milk, egg and vanilla. Pour into the dry ingredients and mix just until combined. Fold in chopped thin mints and chocolate chips. Evenly divide the batter between the wells of a 12 cup muffin tin lightly coated with nonstick spray. In a medium bowl, stir together chopped thin mints, flour, sugar and salt. Mix in softened butter until crumbly. Evenly sprinkle the crumbly mixture on top of the muffin batter. Place into the oven and bake until the tops spring back when lightly pressed in the center or a toothpick inserted into the center comes out mostly clean with a few moist crumbs attached, about 20 to 25 minutes. Remove from the oven and place pan on a wire rack for 5 minutes before carefully turning the muffins out to cool completely. Tonight I made Sweet Potato Ravioli with Lemon Sage Brown Butter Sauce and it was delicious, as it was before. I am a fan. I microwaved the sweet potato for 4 1/2 minutes and it saved a lot of time, rather than baking it for 40 minutes. That's totally the way to go. This is very yummy. This is so yummy that I would make like 5 batches of it and freeze it if I had a deep freezer (and someday I shall...) and then bring it out when there are guests. According to the recipe notes, this freezes very well. I like that. I like things that can be made ahead. But I didn't make it ahead, I made it right before we ate. And it didn't take very long, and it cooked perfectly, and it was very tasty. I used frozen peppers, frozen okra, already-peeled shrimp (so I didn't have to buy as much! I bought 1 lb and it was enough), and extra cayenne. I also used cream of mushroom soup instead of the cream of shrimp soup. This was a good decision. I lightened it by using less butter than is called for, and reduced-fat reduced-sodium soup. This longer ingredient list is worth the effort for a special occasion meal. If you're not a fan of okra, you can leave it out of this dish. The Mexican Polenta that we make every once in awhile is cool because it uses tube polenta that you slice into little rounds. I recently posted on a cooking forum to find other recipes that use tube polenta, and this is a recipe that was suggested. It was OK - we always like cheese - but it wasn't anything special and it was kind of too salty (maybe from the Parmesan or the marinara?). We wouldn't make it again. However, I have a few more tube polenta recipes to try out in the near future! The food was not particularly photogenic. Preheat to 350*. Lightly oil a 8x8 casserole dish. Heat olive oil over medium-high heat. Stir in green pepper, garlic, and green onion; cook until the pepper softens, about 3 minutes. Pour in the marinara and simmer 5 to 7 minutes, stirring occasionally. Mix together Fontina and provolone. Spread a thin layer of sauce over the bottom of the baking dish. Arrange 1/3 of the polenta slices in the dish, top with 1/3 of the cheese mixture. Spread a thin layer of sauce over the cheese. Repeat layering twice. Top casserole with the Parmesan. Bake about 25 minutes or until cheese is bubbly and golden. This recipe was chosen because it uses a habanero. We got a habanero from a streetside produce cart and I haven't been able to find a use for it until now. However, due to a series of stressful events, I modified the recipe a LOT. First, we didn't use red snapper because we can never find snapper in this area. So instead we picked up some rainbow trout. Except it still had the skin on, and skin-on fish really freaks me out and makes me panicky. I don't like it at all. So I had to figure out a way to maneuver the fish to cook it without really looking at it. So instead of busting out the bamboo steamer, which I have yet to figure out how to use, I sprinkled the fish with salt and pepper and set it under the broiler for 5 minutes until it was done. Meanwhile, I made the salsa and I sauteed the spinach on the stove. OK so it took about 15 minutes total. And I covered my fish in salsa, and I only ate the top layer so I couldn't see the skin. It was very hard for me, which I know is stupid, but I'm Lauren so deal with it. It was tasty though. I've never cooked trout and I liked the flavor, or lack thereof. The salsa was also very good. He loved the whole thing and not only ate everything on his plate (except the icky skin), he also ate mine! So we have earmarked this as a "try again with a properly skinned fish" dish. 1. Toss oranges, lemon, shallot, chile, cilantro, lime zest and juice, oil, honey, and 1/8 teaspoon each salt and pepper in a bowl. Let stand at room temperature 15 minutes, gently stirring occasionally. 2. Fill a wok or large pot with 1 inch of water. Bring to a boil. Line bottom basket of a 10-inch, 2-tiered round bamboo steamer with parchment paper. (Alternatively, use two pots fitted with steamer inserts.) Season fish using remaining teaspoon each salt and pepper. Arrange in a single layer in bottom basket. Cover, and set over boiling water. Steam until fish is almost cooked through, about 5 minutes. Put spinach into top basket, and set over bottom basket. Steam until spinach is bright green and just wilted, about 2 minutes more. 3. Divide spinach among 4 plates. Top each with fish and 1/2 cup salsa. Serve remaining salsa on the side. Tonight I made Mango and Black Bean Salad, which we've had as a side dish before. I made enough so it could be a substantial main dish. We had it with chips. It was ready in 10 minutes, which was awesome. The three cheeses in this were supposed to be: parmesan, mozzarella, and gorgonzola. But G doesn't like blue cheese (I only like some kinds, I am picky) and I didn't think it would taste yummy in a macaroni & cheese recipe, so these are the cheeses I used: parmesan, mozzarella, asiago, fontina, and provolone. Yeah. Much better. This was extremely delicious. It doesn't use any butter but is still very creamy and cheesy and wonderful. As a result, it is now superior to the previous macaroni recipe champion. I might take a tip from the old recipe and add some cayenne to this new one next time I make it, because cayenne makes everything better. But this is a definite make-again!! Keep a close eye on the flour while it cooks so it doesn't burn. For a weeknight supper, bake the macaroni in an 8-inch square baking dish for 35 minutes. 1. Heat oil in a medium saucepan over medium heat. Add onion to pan; cook 8 minutes or until tender, stirring occasionally. Add flour and garlic; cook 1 minute, stirring constantly. Stir in milk and bay leaf; bring to a boil. Cook 2 minutes or until thick, stirring constantly with a whisk. Add Gorgonzola, 1/2 cup Parmigiano-Reggiano, and salt; stir until cheeses melt. Discard bay leaf. 3. Cook pasta in boiling water 5 minutes or until almost tender, omitting salt and fat; drain well. Add pasta to cheese mixture, stirring well. Place about 1/2 cup pasta mixture into each of 6 (1-cup) ramekins coated with cooking spray. Sprinkle evenly with mozzarella. Top evenly with remaining pasta mixture. Combine remaining 1/4 cup Parmigiano-Reggiano and panko; sprinkle evenly over pasta mixture. Spray lightly with cooking spray; sprinkle with black pepper. Bake at 375° for 25 minutes or until heated. After years of obsessively eating sushi, living in Japan for 3 years during my childhood, and making sushi at home a few times with my mom, I finally ventured into the sushi-making territory on my own. I'd never made it without my mom. Thanks to Jer and Viv, we have the cool sushi roller and a really great sushi cookbook (Sushi), and imitation crab meat was on sale so it just seemed like tonight should be the night to make us some sushi. I used Alton Brown's recipe for sushi rice because it doesn't require the sushi flavoring or kombu that some recipes call for, and it's extremely easy. I love Alton Brown. Then the recipe for the California Roll itself came from the sushi cookbook. I am going to put both recipes on this one post. Our dinner turned out AWESOME. I am awesome. Hahahaha. OK so a California Roll is easy. But ours really did taste like the ones we get at restaurants, and it was delicious and we were happy. And now we know that if we get sushi cravings and happen to have things like nori and avocado on hand, we can whip some together. Haha. Crab sticks, sometimes called imitation crab sticks, are widely available. Made from fish or seafood, they are neatly shaped logs with a pink strip down one side. Crab sticks are found in california rolls, but because of their neat shape they are also very useful for other types of rolled sushi. Divide the rice into 6 equal portions. Put a sheet of nori shiny-side down on a rolling mat with the longest end toward you and, using wet hands, spread 1 portion of the rice in an even layer on the nori, leaving 3/4 inch of nori visible at the end farthest away from you. Don't squash the rice or make the layer too thick - you should be able to see the nori through the rice. Spread a small amount of wasabi onto the rice at the end nearest you. Lay 2 thin avocado sticks down on top of the wasabi, keeping them parallel to the edge of the nori nearest you, then put 2 pieces of crab next to them. Add a line of thin cucumber sticks. To roll the sushi, fold the mat over, starting at the end where the ingredients are, and tucking in the end of the nori to start the roll. Keep rolling, lifting up the mat as you go and keeping the pressure even but gentle until you have finished the roll. Moisten the top edge of the nori with water to seal the sushi roll closed. Don't worry if anything falls out the sides, just push it back in. The edges may well look ragged, but don't worry. Remove the roll from the mat and cut it into 4 even-size pieces with a wet, very sharp knife. If you don't use a sharp knife the roll will squash as you cut it. Arrange the rolls on a plate. Repeat with the remaining ingredients. Serve with shoyu, pickled ginger, and some extra wasabi paste. I like beets. I think they taste like baby corn. I have to admit that this recipe was fairly disappointing to me, as it had received a ton of excellent reviews on the Cooking Light Bulletin Boards. It just isn't particularly special. I probably wouldn't make this again, but I am very happy that I can cook beets for us now! Boil or steam beets until almost tender. Rinse in cold water and cut into halves. Combine butter, honey, ginger and soy sauce in a small saucepan and heat until butter and honey are melted. Brush some sauce over beets and place on heated broiler pan. Broil 5-10 minutes until tender, basting frequently. Transfer to a serving dish and pour remaining sauce over. OK I know it says Wildflower Honey in the title, but I just used regular clover honey from a squeezable bear. I did not see the point. This is my first time ever making baklava - a pastry I have loved immensely for my whole life. I was kind of scared, and I ended up screwing up because I only put one layer of phyllo on top instead of 6! So the top didn't end up as well as it could have. But as a whole, it turned out very well and I am very happy. I really like the mixture of nuts (walnuts, pistachios, and almonds) and the nice honey flavor. I think the cloves were a little strong so I would cut back on that a little bit. He only thought it was OK, but he's never been a fan of baklava so oh well. I liked it and would probably make it again. And maybe next time, I would make it correctly. Wildflower honey adds a delicate floral scent to this classic dessert, but almond honey would also work well in this recipe. If you can't find unsalted pistachios, use salted and omit the added 1/8 teaspoon salt. To prepare syrup, combine honey, 1/2 cup water, juice, cloves, and cinnamon in a medium saucepan over low heat; stir until honey is completely dissolved (about 2 minutes). Increase heat to medium; cook, without stirring, until a candy thermometer registers 230° (about 10 minutes). Remove from heat; keep warm. Remove solids with a slotted spoon; discard. To prepare filling, combine pistachios and next 6 ingredients (through salt); set aside. Lightly coat a 13 x 9-inch baking dish with cooking spray. Working with 1 phyllo sheet at a time (cover remaining dough to prevent drying), place 1 phyllo sheet lengthwise in bottom of prepared pan, allowing end of sheet to extend over edges of dish; lightly coat with cooking spray. Repeat procedure with 5 phyllo sheets and cooking spray for a total of 6 layers. Sprinkle phyllo evenly with one-third of nut mixture (about 2/3 cup). Repeat procedure with phyllo, cooking spray, and nut mixture 2 more times. Top last layer of nut mixture with remaining 6 sheets phyllo, each one lightly coated with cooking spray. Lightly coat top phyllo sheet with cooking spray; press baklava gently into pan. Sprinkle baklava surface with 1 tablespoon water. Make 3 even lengthwise cuts and 7 even crosswise cuts to form 32 portions using a sharp knife. Bake at 350° for 30 minutes or until the phyllo is golden brown. Remove from oven. Drizzle honey mixture evenly over baklava. Cool in pan on a wire rack. Store covered at room temperature. This is a very, very weird dish. I was skeptical about it because it combines sweet flavorings for sweet potatoes (honey, pumpkin, nutmeg, orange) with completely separate savory flavors (chipotle, chorizo - or in our case, Soyrizo - and cheese). I had read about it on Joe's Blog and was intrigued so I decided we should try it... but it's just really weird. The orange flavor was too overpowering, and I just didn't really like it much at all. It's so very weird. And as it turns out, it originates from Ms. Rachael Ray. Typical. We would not make this again. Note: Normal cheddar cheese can be used just fine. Drizzle sweet potatoes with olive oil and rub them all over to coat. Season with a bit of salt and fresh ground black pepper - set the potatoes on a small baking sheet. Bake until tender, about 45 to 55 minutes. Remove and set aside until they are cool enough to handle. While you wait for the potatoes to cool, heat a medium skillet over medium heat - add chorizo and sauté until crisp, about 5 to 6 minutes. Remove and scoop the meat onto a plate lined with paper towels. Cut the potatoes in half lengthwise - scoop out the insides using a spoon, but make sure to leave a little around the edges and bottom near the skin so the potato will retain its shape. To the same pan you cooked the chorizo in, add the scoops of sweet potato, broth, butter, pumpkin, honey, garlic, chipotle and adobo sauce, orange zest, juice, nutmeg. Season with salt and fresh ground black pepper to taste. Coarsely mash the mixture together with a potato masher. Carefully refill the sweet potato shells with the mashed mixture and place them back onto the baking sheet. Scatter the tops with the reserved cooked chorizo and a scattering of the shredded cheese. Place the potatoes under the broiler to melt the cheese, about 1 minute. Sometimes on the Food Network when they talk about the famous Roscoe's Chicken 'n' Waffles, I get jealous because I can never have that since I don't eat chicken. Savory waffles? How very bizarre. But it's OK now, because I found a Paula Deen recipe for cornmeal waffles topped with chili. She makes a meaty chili (recipe here), but I used the bean chili I've made for another recipe (here) and it worked just fine. The waffles are tasty and are like fluffy cornbread. They would probably be good as a breakfast with some blueberry syrup...yum!!! Anyway this recipe was yummy and we would probably make it again. In a large bowl, combine flour, cornmeal, baking powder, sugar, and salt. Add milk, oil, and eggs; stirring until smooth. Pour batter onto hot waffle iron and bake in batches. Set aside and keep warm. Serve with Spicy Chili. Garnish with shredded Cheddar, sour cream and chopped fresh cilantro. Tonight's dinner obviously won't be counted amongst the best meals we've ever had, but it's certainly one of the best that can be made in under 10 minutes. We used frozen edamame dumplings from Trader Joe's, which cooked alongside the vegetables since they only needed to steam for about 6 minutes. Sauce came together quickly, everything was fast, and hooray dinner was on the table. It was yummy! I would make this again on a night when I don't have a lot of time. Fill a large saucepan with 1 inch of water and fit with a steamer basket (or fill a large skillet with 1/2 inch of water). Bring the water to a boil. Place the pot stickers in the basket (or skillet), cover, and steam for 4 minutes. Add the snap peas and carrots, cover, and steam until the pot stickers are cooked through and the vegetables are tender, 4 to 6 minutes. Meanwhile, in a small bowl, combine the soy sauce and sesame oil. Divide the bean sprouts among bowls and top with the pot stickers and vegetables. Sprinkle with the peanuts and scallions. Serve with the sauce. I didn't make anything for dinner last night because I had my internship til late (Back to School Night), and I didn't make anything for dinner tonight because Gibby was at work (Back to School Night, too!) and I had class. So I decided to compensate by making a picture post. I like how wordpress makes thumbnails though and I couldn't figure out how to do that on blogger, so I put it on our personal website. As I mentioned on Saturday, we've been wanting grilled cheese. And tomato soup. So tonight I made both. We had just a basic grilled cheese (bread, cheese, butter, yum?) and then I tried out a new recipe for the tomato soup. This one is interesting because it has some pasta and spinach in the mix. I didn't have enough vegetable broth (only about 3/4 cup) so I compensated with some water and it was not noticeable. I also threw in some red pepper flakes when I added the garlic. This gave it a nice, mild kick. Yes, I know I made soup last night too. But we like soup!!! So how did it go over? I thought it was pretty good and I would eat it again, although I got bored about halfway through. But it's OK. We both liked it, so I would make it again. Even though it is 88 degrees outside for some bizarre reason, it is still sort of autumn and I want to start cooking fall-related foods. This soup smells like fall, tastes like fall, and is perfect for a cold day...not quite a day like today. But we both liked this soup. The swiss chard was a little bit overpowering so if I were to make it again I would either use less of it or I would substitute spinach or something. Maybe kale. I could play around. It was very yummy though - especially the croutons. We would make this again. Oh! It should be noted that I cheated and bought canned Great Northern Beans. I skipped the lengthy first step, and then I only simmered the soup for about 45 minutes. Enjoy half of this comforting soup now, and freeze the other half for a quick meal on a busy day. For best results, prepare the croutons shortly before serving. To prepare the soup, sort and wash the beans; place in a large Dutch oven. Cover with water to 2 inches above beans; cover and let stand 8 hours or overnight. Drain beans; set aside. Heat 2 tablespoons oil in Dutch oven over medium heat. Add onion and carrot; cook 8 minutes, stirring frequently. Add garlic; cook 1 minute, stirring frequently. Increase heat to medium-high. Add wine; cook until liquid is reduced to 1/2 cup (about 5 minutes). Add salt, pepper, and rosemary sprig; cook 30 seconds, stirring constantly. Stir in beans, 6 cups water, and broth; bring to a boil. Reduce heat; simmer 1 hour and 30 minutes or until beans are tender, stirring occasionally. Add chard; cook 15 minutes or until chard is tender. Discard rosemary sprig. To prepare croutons, combine 2 tablespoons oil and bread; toss to coat. Add chopped rosemary; toss to combine. Arrange bread in a single layer on a baking sheet. Bake at 400° for 10 minutes or until golden, turning once. Ladle about 1 1/2 cups soup into each of 8 bowls; divide croutons evenly among bowls. Sprinkle each serving with 1 tablespoon cheese. We needed a sweet item to take in our lunches this week, but his job has now forbidden nuts of all sorts. He works with children with autism, who frequently have severe food allergies, especially with nuts. So no nuts of any kind are allowed. This was hard for me because I kept gravitating towards peanut butter cookies or peanut butter brownies... maybe because peanuts aren't allowed, I wanted them even more? I don't know. But I eventually decided we should have sugar cookies. This recipe is from Cook's Illustrated, which is a magazine I used to subscribe to for a long time but canceled because they are often extremely nitpicky and wordy. While that is sometimes appreciated, I got bored reading the magazine and canceled. But maybe I should look into it again. They do have good recipes. Though I used the poo-pooed King Arthur Flour (my personal favorite), I found that the cookies did not turn out "drier and cakier." I don't think I would qualify them as soft though; they are kind of crispy. I think this comes from the aerated baking sheet I used. But anyway, these are yummy cookies. I've been trying to find a good sugar cookie that tastes like the ones you can get at bakeries or from Pepperidge Farm, and so far this is the one that's come closest. We'll keep trying new recipes though, but this is a good one to fall back on. The cookies are softer and more tender when made with unbleached flour that has a protein content of about 10.5 percent. Pillsbury or Gold Medal works best; King Arthur flour has a higher protein content (around 11.7 percent) and will result in slightly drier, cakier cookies. Do not discard the butter wrappers; they have just enough residual butter on them for buttering the bottom of the drinking glass used to flatten the dough balls. To make sure the cookies are flat, choose a glass with a smooth, flat bottom. Rolled into balls, the dough will keep in the freezer for up to 1 week. The baked cookies will keep in an airtight container for up to 5 days. 1. Adjust oven racks to upper- and lower-middle positions; heat oven to 375 degrees. Line two large baking sheets with parchment paper. Whisk flour, baking powder, and salt in medium bowl; set aside. 2. In standing mixer fitted with paddle attachment or with hand mixer, beat butter, 1 cup granulated sugar, and brown sugar at medium speed until light and fluffy, about 3 minutes, scraping down sides of bowl with rubber spatula as needed. Add egg and vanilla; beat at medium speed until combined, about 30 seconds. Add dry ingredients and beat at low speed until just combined, about 30 seconds, scraping down bowl as needed. 3. Place sugar for rolling in shallow bowl. Fill medium bowl halfway with cold tap water. Dip hands in water and shake off excess (this will prevent dough from sticking to your hands and ensure that sugar sticks to dough). Roll heaping tablespoon dough into 1 1/2-inch ball between moistened palms; roll ball in sugar, then place on prepared baking sheet. Repeat with remaining dough, moistening hands after forming each ball and spacing balls about 2 inches apart on baking sheet (you should be able to fit 12 cookies on each sheet). Using butter wrapper, butter bottom of drinking glass; dip bottom of glass in remaining sugar and flatten dough balls with bottom of glass until dough is about 3/4 inch thick. 4. Bake until cookies are golden brown around edges and just set and very lightly colored in center, 15 to 18 minutes, reversing position of cookie sheets from front to back and top to bottom halfway through baking time. Cool cookies on baking sheet about 3 minutes; using wide metal spatula, transfer cookies to wire rack and cool to room temperature. I saw this recipe referenced a ton all over the internet over the past couple of weeks, and I was intrigued, so I decided to try it. It seems simple enough, and it is simple, but it yields such crispy, delicious potato goodness. It's wonderful and excellent as a side dish. I used a mixture of red, Yukon gold, and purple new potatoes so that's why our plate is colorful. We also used rosemary as our main herb. To see where this was originally posted, check out The Pioneer Woman Cooks. She has tons of photos of this recipe and how to make it step by step. I will just post her text, edited a bit, and my own photos. But this recipe is definitely a make-again!!! Begin by bringing a pot of salted water to a boil. Add in as many potatoes as you wish to make, and cook them until they’re fork-tender. Next, generously drizzle olive oil on a sheet pan. This will mean the difference between the potatoes sticking and not sticking, so don’t be shy here. When the potatoes are tender, place them on the cookie sheet, giving them plenty of room to spread out. Next, grab your potato masher and gently press down on the potato until it slightly mashes. Then rotate the masher 90 degrees and finish flattening it. Of course, you don’t want to absolutely smash it into the pan—you want it almost to resemble a cookie. Repeat until all are flattened. And really, I don’t know why you couldn’t use the bottom of a glass for this step if you don’t have a potato masher. The surface might not be as textured and interesting, but I think it still might work. Next, brush the tops rather generously with olive oil. Next, grab some Kosher salt. You can use regular salt, but The Pioneer Woman really recommends using kosher. It adheres to the potatoes more easily and really flavors them nicely without getting too salty. Remember: potatoes need salt. Don’t skimp! Be ye ever as generous with fresh ground black pepper. Now, you can grab some chives…or thyme…or whatever herbs you have available. Whatever herb you use, just chop it pretty finely and sprinkle over the top. Now throw them onto the top rack of a very hot (450-degree) oven, and cook them for 20-25 minutes, or until they’re golden and crispy and sizzling. Tonight's grilled cheese was meant to be quick because we were supposed to babysit for a friend, but that got canceled so I added a side dish (Crash Hot Potatoes) and took my time with these sandwiches. I used premade pesto because I killed my basil plant - no surprise there, I never keep plants alive. Trader Joe's makes a good pesto. We used our Griddler's panini function to make the sandwiches perfectly toasty. I only put tomatoes on mine because he doesn't like tomatoes, though I forced him to take a bite of my sandwich and he agreed it "wasn't bad." I loved mine. He loved his tomato-less one because he said it reminded him of the fried mozzarella at Macaroni Grill, which has pesto under the breading. So this is a make-again since we were both very happy. Toast pine nuts in a skillet over medium heat until fragrant, about 5 minutes. Combine pesto ingredients in a food processor and pulse until well combined but still rough-textured. If you have a panini press, turn it on to warm up; otherwise, set a cast iron skillet over medium heat. Assemble sandwich by smearing insides of bread slices with pesto. Arrange a layer of sliced tomato and season with a few turns of fresh pepper. Layer the mozzarella slices over the top and then place another piece of bread on top to make the sandwich. Drizzle olive oil over skillet's surface and place sandwiches on the hot skillet or panini press. If using a skillet, place another heavy skillet over the top to form a "press". Turn after 2 to 3 minutes and replace weight. The sandwich is ready when golden brown and mozzarella has melted around the edges. After a long, stressful week, our favorite Swiss-Style Cheese Bake was perfect. I used every kind of cheese we had, including cheddar, monterey jack, Belgian swiss, and Parmesan. Yum!! Tonight for dinner I made Mexican Polenta, which was delicious as always. I added some green onions and sour cream and we enjoyed it a lot. Today's new recipe was from my lunch! I found a quick recipe on Epicurious for a sandwich that sounded yummy. It didn't take too long this morning, and it was definitely yummy. My only complaint is that by lunch time, it had gotten a little bit soggy from the strawberries. I would make this again on weekends, but not for my lunchbox. It doesn't seem to hold up well over time. But it definitely is tasty! No picture, because I'm not about to take a picture at 7 in the morning. 1. Lay the bread slices on a work surface. Spread the peanut butter on one slice and the cream cheese on the other. 2. Arrange strawberry slices in an even single layer on top of the peanut butter. Drizzle the honey on the berries and then place the other slice of bread with the cream cheese on top. Cut into halves or quarters. This is similar to other recipes we've made, but we obviously like the flavor and the simplicity. It also helped to use the prepackaged ravioli because it made it super-quick. We even had time to watch some TV after dinner before I had to head out to class! Not only was it quick and easy, it was very tasty and we enjoyed it. We used spinach-ricotta ravioli and it worked great with the flavors. We would definitely make this again. Meanwhile, heat the butter in a large skillet over medium-low heat until it foams. Add the shallots and cook, stirring, until golden, 1 to 2 minutes. Increase heat to medium, add the sage, and cook until the leaves turn crisp, about 1 1/2 minutes. Remove from heat. Season with the salt and pepper. Return the drained ravioli to the pot, add the butter and sage, and toss gently. Add 1/2 cup of the Parmesan and toss again. I meant to make this last week but the week was too hectic so I ended up bouncing some of the meals to this week. Plus we were a little bit burned out on Asian food. So tonight I made this edamame lo mein. I used some awesome whole wheat spaghetti made with flax seed for some added nutritional benefits, and I used some extra crushed red pepper although it didn't make it spicy. This does not taste at all like the lo mein from restaurants, but it is still yummy. It's a typical Asian noodle dish, just with a lot of delicious edamame in it. We would make this again. 1. Bring a large pot of water to a boil. Add spaghetti and edamame and cook, stirring occasionally, until the pasta is just tender, 8 to 10 minutes or according to package directions. Drain. 2. Meanwhile, whisk scallions, oyster sauce, vinegar, soy sauce, sugar, sesame oil and crushed red pepper in a small bowl until the sugar is dissolved. 3. Heat canola oil in a large nonstick skillet over high heat. Add carrots and bell peppers and cook, stirring often, until slightly softened, 3 to 4 minutes. Add the pasta and edamame. Cook, stirring occasionally, until the pasta is crispy in spots, 1 to 2 minutes. Add the sauce and stir to combine. I've been craving cake, so I decided we must have cake. I decided to make an angel food cake, since we have a special angel food cake pan we got from our friend Shafiee. I was appalled at all the egg yolks that were not being utilized. However, once the cake was all done, I was very happy. Beyond very happy, in fact. This may be the best dessert we've made in a long time. I wish I had a serrated cake-cutter because I made a mess cutting slices, but oh well. It is delicious!!! And I didn't screw up my first angel food cake. Hooray! We would definitely make this again!! Just in case you don't believe us that it was awesome, here is a video of our dog trying to reach it on the dining room table. She has never done this before, even with her own food and toys, so it obviously means the cake is amazing. If you can't decide whether you want vanilla or chocolate, this cake is for you because it delivers both. Beaten egg whites create the light, airy texture of this classic dessert. Place leftover yolks in an airtight container, cover with a thin layer of water, and refrigerate for up to two days; use them to make custards. To prepare cake, lightly spoon flour into a dry measuring cup; level with a knife. Combine flour and 3/4 cup granulated sugar, stirring with a whisk; set aside. Place cream of tartar, salt, and egg whites in a large bowl; beat with a mixer at high speed until foamy. Add remaining 3/4 cup granulated sugar, 1 tablespoon at a time, beating until stiff peaks form. Beat in juice and 1/2 teaspoon vanilla. Sift flour mixture over egg white mixture, 1/4 cup at a time; fold in after each addition. Spoon half of batter into an ungreased 10-inch tube pan, spreading evenly. Break air pockets by cutting through batter with a knife. Sift 2 tablespoons cocoa over remaining batter; fold in. Spoon cocoa batter evenly over top of vanilla batter; break air pockets by cutting through cocoa layer with a knife. Bake at 325° for 55 minutes or until cake springs back when lightly touched. Invert pan; cool completely. Loosen cake from sides of pan using a narrow metal spatula. Invert cake onto a plate. To prepare glaze, place powdered sugar, cream cheese, milk, and 1 teaspoon vanilla in a medium bowl; beat with a mixer at medium speed until smooth. Drizzle half of glaze over cake. Add 3/4 teaspoon cocoa to remaining glaze; stir well to combine. Drizzle cocoa glaze over cake. Refrigerate 5 minutes or until glaze is set. Garnish with strawberries, if desired. This recipe had some issues from the start. First, I could not find farro so I decided to substitute wheat berries, which are not at all the same but are at least another grain. Oh except the wheat berries take twice as much time to cook as farro, which I didn't realize until I started dinner. Then, I didn't have white wine vinegar so I subbed red wine vinegar, and it turned out to be too acidic. And then the avocados weren't ripe. So we had vinegary, avocado-less wheat berries. It turns out that we enjoy wheat berries in general so I will make more recipes using them, but this just didn't work for us. Farro is a whole grain with a pleasantly chewy texture. Look for it at specialty markets and gourmet grocers or health food stores. With crunchy cucumber, sweet cherry tomatoes, and buttery avocado, this dish makes a refreshing lunch. Pair it with a simple starter soup and whole-grain crackers for dinner. 1. Place farro in a large saucepan; cover with water to 2 inches above farro. Bring to a boil. Cover, reduce heat, and simmer 30 minutes. Drain and rinse with cold water; drain well. 2. Combine oil, rind, juice, vinegar, salt, and pepper in a large bowl; stir with a whisk. Add farro, tomatoes, cucumber, and cilantro; toss gently to coat. Place about 1 cup farro mixture on each of 5 plates; garnish evenly with avocado. Serve immediately. Yes, that is the real title of this recipe, which I got off of the Cooking Light Bulletin Boards. It is originally from Eat Shrink and Be Merry by Greta and Janet Podleski. This soup took awhile to make because I was a genius and decided to cook my wild rice from scratch, which takes 45 minutes (use a pre-cooked one like the stuff from Trader Joe's or even Uncle Ben's to make it go quicker!). But once the rice is done everything comes together pretty quickly. It has a very nice flavor, but you have to really like curry!! We liked it a lot and agreed that we would definitely make it again. We do not have a picture but the soup is kind of ugly anyway so you're not really missing out. It's yellow with chunks in it. Yum? Heat butter in a large non-stick soup pot over medium heat. Add leeks and garlic. Cook and stir until leeks begin to soften, about 3 minutes. Stir in cauliflower, sweet potato, curry and cumin. Cook and stir for 1 more minute. Add broth, salt and pepper. Bring mixture to a boil. Reduce heat to low, cover, and simmer for 12 to 15 minutes, until vegetables are tender. I finally found some phyllo dough so we made these samosas for dinner. They are not quick, but they are not too hard. I am incapable of folding them properly though. The directions make it sound so easy to fold into a nice little triangle. It is not very easy. We liked them, especially the filling and the contrast with the mint (which seems excessive but actually is the perfect amount), but he was put off by the phyllo dough, which he had never eaten before. He prefers samosas made of dough, like others we've made. I thought the phyllo dough was fine, but it did get soggy quickly. We probably wouldn't make this again. Samosas, traditional Indian pastries filled with vegetables, meat, or both, are typically made with homemade dough, then fried. Our samosas remain light and crisp because we enclose the filling in phyllo dough and then bake them. When processing the filling, pulse just until the ingredients are chopped so it retains its texture. 1. To prepare samosas, cook potato and carrot in boiling water 8 minutes or until tender; drain. 2. Heat oil in a wok or large skillet over medium heat. Add onion to pan; cook 10 minutes or until lightly browned, stirring frequently. Add ginger, garlic, and red pepper; cook 2 minutes, stirring frequently. Stir in cumin and next 5 ingredients (through turmeric); cook 15 seconds, stirring constantly. Add potato mixture, peas, cilantro, and juice, stirring well to combine; cool slightly. Place half of filling in a food processor; pulse until coarsely chopped. Spoon chopped filling into a bowl. Repeat procedure with remaining filling. 4. Place 1 phyllo sheet on a large cutting board or work surface (cover remaining dough to prevent drying); lightly coat with cooking spray. Fold phyllo sheet in half lengthwise to form an 18 x 7–inch rectangle. Spoon about 3 tablespoons filling onto bottom end of rectangle, leaving a 1-inch border. Fold left bottom corner over mixture, forming a triangle; keep folding back and forth into a triangle to end of phyllo strip. Tuck edges under triangle; lightly coat seam with cooking spray. Place triangles, seam side down, 2 inches apart on baking sheets coated with cooking spray. Repeat procedure with remaining phyllo, cooking spray, and filling to form 16 samosas. 5. Bake at 350° for 13 minutes with 1 baking sheet on bottom rack and 1 baking sheet on second rack from the top. Rotate baking sheets; bake an additional 12 minutes or until samosas are lightly browned. 6. To prepare raita, combine yogurt and mint. Serve with samosas. At first I didn't even understand what this recipe was talking about, because "tartine" to me sounds more like a casserole (terrine) or a tart. But then I figured out it was an open-faced sandwich. And since I love all of the ingredients, I decided to try it. Other than some non-food related chaos (dog threw up), dinner was ready within about 15 minutes. I didn't expect him to like it because it's kind of gourmet, but it worked out well and he really liked it. The sriracha certainly helped! We would potentially make this again, maybe even in smaller batches as a party appetizer if we ever have a party. Preheat broiler. Brush eggplant on both sides with 3 tablespoons oil (total). Season with 1/2 teaspoon salt. Broil in 1 layer in an oiled 4-sided sheet pan 5 to 7 inches from heat, turning once, until browned and tender, 8 to 10 minutes total. Cool completely, then coarsely chop. Whisk together sun-dried tomatoes, Sriracha (if using), and remaining 2 tablespoons oil in a large bowl. Add arugula and salt to taste, then toss. Spread hummus on baguette, then make open-face sandwiches with eggplant and arugula. I had like an hour between work and my night class today so I figured I'd throw together this quick dinner. But it was fraught with disaster... the water would not boil. It just would not. It took so freaking long. I got my dinner on the plate 4 minutes before I had to be out the door, shoveled it into my mouth, and then ran out to class. I made it in time, for your information. I THINK dinner was good, but it wasn't very special. It could have had more seasoning. We probably won't make it again. To go with our burgers for Labor Day, I made this potato salad from Cooking Light. It has everything we love: potatoes, mayo, hard boiled eggs, red onions, yum yum yum. It came together nicely in the morning, chilled all day, and was quite tasty when it was time to eat. Unlike some other recipes I have tried, this one had just the right amount of mustard - enough for flavor, but not overpowering. We liked this a lot. I would definitely make it again. I am taking some with me for lunch tomorrow! An all-American necessity at summer get-togethers and reunions, this creamy, old-fashioned potato salad uses pickle relish, eggs, and mustard. Place potatoes in a saucepan, and cover with water. Bring to a boil. Reduce heat; simmer 10 minutes or until tender. Drain. Cool and peel. Cut potatoes into 1/2-inch cubes. Place potatoes in a large bowl; sprinkle with vinegar and oil. Add celery, onion, pickle relish, and eggs; toss gently. As a foodie, yet a vegetarian (pescetarian), sometimes I see a recipe that is meaty but sounds soooooo good, so I try my best to vegetarianize it. Sometimes this works really well. Sometimes it does not. Unfortunately, tonight I really butchered (lol pun) a recipe that I'm certain would be delicious in its traditional meaty form. As such, I will post the original recipe so that you meatatarians can make it for yourselves. 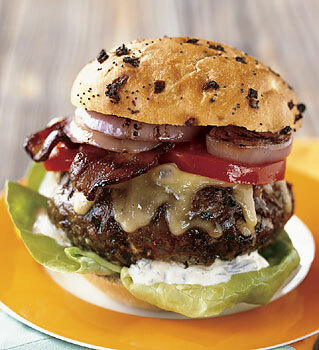 Our changes: OK instead of the super-flavorful glazed burger, I used a regular Boca Burger. Instead of crispy bacon, we used Morningstar Farms fake bacon. I still made the sauce, and I used a delicious Wisconsin sharp cheddar. It just wasn't as good as it would have been otherwise. Oh well! Good try. The little green chile makes an appearance in the burger and in its creamy ranch sauce. Stir first 5 ingredients in small saucepan over medium heat until coffee is dissolved. Remove from heat. Whisk in butter. Season glaze to taste with salt and pepper. Spray grill rack with nonstick spray. Toast buns until golden, about 2 minutes per side. Transfer buns, cut side up, to plates. Place lettuce on each bun bottom. Grill burgers 5 minutes, basting with glaze. Turn burgers, baste with glaze, and grill until cooked to desired doneness, about 5 minutes longer for medium. Press cheese atop each burger and allow cheese to melt. Place some sauce, then 1 burger on each bun bottom. Top each with 2 slices bacon and desired additional toppings. Cover with bun top. Serve with remaining sauce.